Microcrystalline cellulose, magnesium stearate, stearic acid, silica, hydroxypropyl methylcellulose and pharmaceutical glaze. As a dietary supplement for men, take 2 tablets once daily. Healthy, natural testosterone levels promote strength, endurance, stamina, vitality, energy, brain function, mood, sexual function and more. 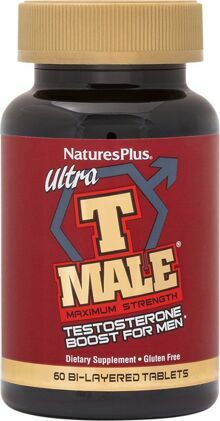 ULTRA T MALE dual-action Bi-Layered Tablets help nutritionally maximize healthy production of revitalizing testosterone, immediately and throughout the day or night. The rapid-release layer delivers powerful maximum-strength testosterone-revving nutrients: GlucodOX AMPK Booster, ViNitrox fruit polyphenols, Tongkat Ali, calcium, fenugreek and high potency zinc. The extended release layer delivers the same powerful nutrients over the next 10 hours for long-lasting nutritional benefits. 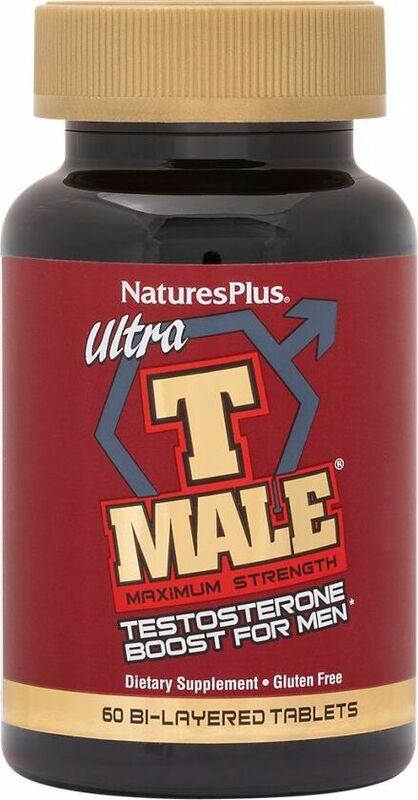 Original T MALE Capsules and T MALE Liquid continue to provide the solid testosterone-boosting nutritional support that thousands of men rely on every day. But the immediate and long-lasting nutritional effects of ULTRA T MALE Bi-Layered Tablets go even further, for more powerful, longer-lasting testosterone support than ever before! GlucodOX AMP Activated Protein Kinase Hormone Booster: AMPK enzyme is the master regulator of hormone production, including testosterone. Studies show this boosts AMPK activity and hormone production by boosting cellular energy at production sites. Tongkat Ali (Eurycoma longifolia): Known as an aphrodisiac by cultures of the South Pacific, Tongkat Ali's testosterone boosting nutritional activity is now being confirmed by modern science. Zinc Aspartate: Zinc aspartate, providing 30 mg of highly bioavailable zinc, has been shown to increase free testosterone. Researchers believe that because zinc plays multiple roles in testosterone production and regulation, even marginal deficiency can reduce testosterone levels by up to 50%. Calcium: Calcium is a key mineral used by the body's hormone-producing enzymes to safely and naturally generate healthy endogenous testosterone. Fenugreek: Since ancient times, fenugreek has been believed to promote fertility. More recently, researchers have found that the saponins in fenugreek may significantly promote testosterone production, while improving numerous other indicators of healthy male reproductive function. 60 Tablets This is a Buy 1 Get 1 FREE offer!